Grand Prix racing is the art of balancing on the edge, not too little but not too much either. This is true not only for the drivers but also for the constructors. The all conquering Lotus 79 was a first-class wing car. The car that Colin Chapman made for the 1979 season, the Lotus 80, proved to be a case of driving the wing technology over the limit. The result was a catastrophe. The BRM 16-cylinder engines looked much more competitive on paper than in true life, the ultra-low Brabham BT55 project ended in tragedy, the mid-engined March 722 proved to be undrivable. Grand Prix history is full of examples. There is something special about the name "Mercedes-Benz". For the Grand Prix historian it immediately creates associations with invincibility, quality and faultless organization. Therefore it may come as a surprise when one realizes that the almighty Mercedes has had its share of real duds. The 1999 Le Mans event is something the manufacturer surely wants to forget. The 1924 8-cylinder car proved to have dangerous handling, killing Count Zborowski at the Italian GP. But the most frustrating season in the team's history is possibly 1936. The Mercedes team had been the pace setter during the 1934-'35 seasons with their W25 car. Having started off with a type A 3.4-litre engine the volume had been increased in several steps from the 3.7-litre AB through the 4-litre type B to the 4.3-litre type C. To face the challenge from the new cars of Auto Union and Alfa Romeo the Mercedes factory decided to construct a new 600bhp 5.6-litre V12 for the 1936 season. This D-type engine became known as the DAB as it had the same bore and stroke as the AB engine. When the first engine was assembled during the summer of 1935, it proved to be seriously overweight (295 kg against 185 kg for the old engine). To fit this heavy engine into the cars under the 750 kg limit demanded considerable changes to be done to the 1936 cars to save 110 kg of weight. Mercedes-Benz made the radical decision to cut off 25cm from the wheelbase of their GP car. Other new parts in the car included a transverse gearbox and a de Dion rear axle. (It has often been said that the Mercedes W125 was the car that re-introduced the de Dion axle, but the 1936 Mercedes had in fact been the first.) The new car was in fact so small that the tall von Brauchitsch could not fit into it properly. Somehow the engineers managed to squeeze the engine in under the weight limit only to find that the weight distribution was such that the car was totally undrivable, just as March would find with their car in 1972. Instead a 4.7-litre 450bhp variant of the old engine (known as ME25) had to be built in a hurry and put into the new cars. But that was to demand too much of the old engine block. During the season the cars suffered from numerous engine failures. The car also had bad road holding, it was oversteering and the steering wheel gave a heavy kickback to the drivers. The chassis wasn't rigid enough for the suspension to work in a proper way. But at the season opener at Monaco most of the worst faults on the car had not been found yet and the team still had high hopes for the season. The team entered four cars for the race, two 1936 cars for their new driver Louis Chiron and their first driver Caracciola and two of the old 1935 cars for von Brauchitsch and Fagioli. Luigi Fagioli's career started off with a Salmson in 1926. In 1930 he joined the Maserati team and with their cars he proved to be one of Italy's finest drivers, winning the Coppa Ciano and Circuit of Avellino in 1930, the Monza GP in 1931 and the Rome GP in 1932. In 1933 he joined the Ferrari team, winning the Coppa Acerbo, and the Comminges and Italian Grand Prix. For 1934 he was offered a place in the Mercedes team. Known as "the Abruzzi robber" Fagioli had a reputation of a "wild man" with several crashes on his record. He was muscular, built like a boxer and had a temperament that fitted his appearance. Joining the Mercedes team Fagioli considered himself at least the equal to the German drivers, in fact he considered himself to be the leading driver of the team. In the very first race that all resulted into conflict: a furious Fagioli abandoned his car after having been given team orders to stay behind von Brauchitsch. The same thing happened at the 1935 Belgian GP and in both seasons there were countless troubles in the team as Fagioli tried to pass Caracciola against team orders. But Fagioli also proved to be a fine asset to the team, winning the Coppa Acerbo, the Italian and Spanish GPs in 1934 and the Monaco, AVUS and Penya Rhin GPs in 1935. So for 1936 his contract was renewed as Mercedes-Benz could not afford to give up a driver of his capabilities, possibly to a team like Auto Union. Apart from Mercedes, the start list for the 1936 Monaco Grand Prix included three Auto Unions to be driven by Stuck, Varzi and Rosemeyer, four Ferrari Alfa Romeos for Nuvolari, Brivio, Tadini and Farina, three Scuderia Torino Maseratis for Trossi, Siena and Ghersi, a single works Bugatti for Wimille and private entries for Étancelin (Maserati), Sommer (Alfa Romeo) and 1929 Monaco winner William Grover-Williams (Bugatti). Chiron's career as Mercedes-Benz works driver got off to a good start when he took pole position, Nuvolari taking his Alfa into second place with Caracciola in third position. There was torrential rain and terrible conditions as the cars lined up for the grid. Farina's Alfa was leaking oil so he took over Tadini's car, while Tadini took a chance to start with Farina's car. 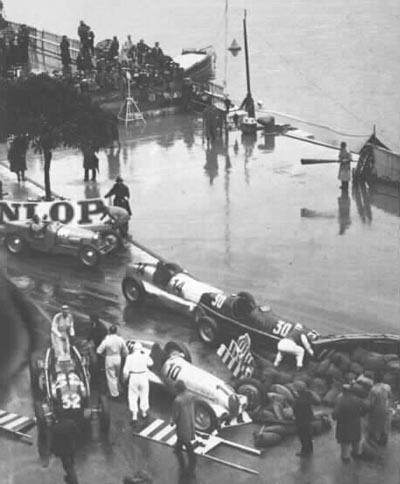 It was Caracciola who made the best start as the flag dropped to take the lead followed by Nuvolari, Chiron and Rosemeyer. At the chicane after the tunnel Tadini left a large pool of oil. Passing the chicane on lap 2 the leading cars succeeded in staying clear of the oil but Chiron spun and crashed creating a mass pile-up involving Farina, von Brauchitsch, "Williams", Siena, Trossi, Brivio and Tadini. 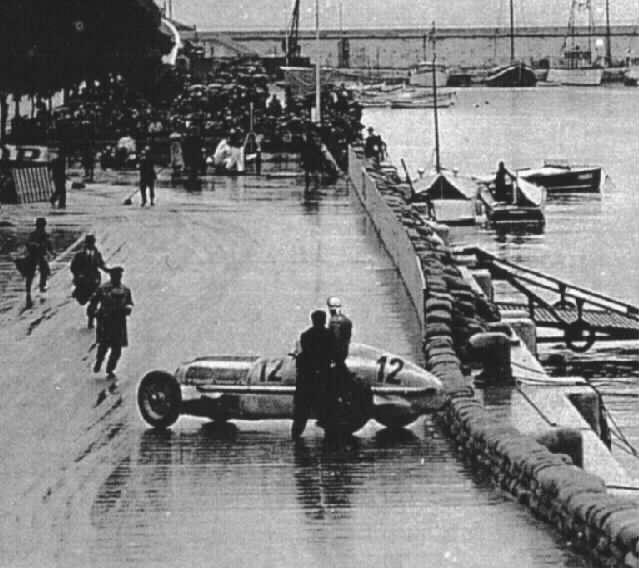 On the next lap Rosemeyer's car went sideways through the chicane but somehow managed to stay clear but on lap 6 he had to make a pitstop and fell back. On lap 9 Fagioli in 5th place made the same mistake as Chiron and crashed at the chicane. Fagioli was the third Mercedes-Benz driver to retire on the same spot! 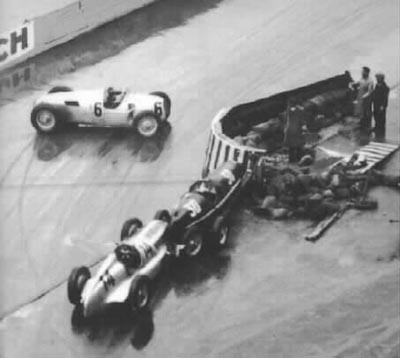 After 10 laps Nuvolari passed Caracciola to take the lead and started to extend the gap by one second per lap, but 17 laps later Nuvolari's car developed brake problems and he had to slow down and let Caracciola's Mercedes by again. Halfway the Auto Unions and Alfas came in for refuelling but Caracciola did not come in. It soon became clear that the Mercedes driver was running on a non-stop race strategy. That meant that Caracciola now had an enormous advantage and could control the rest of the race to take a superb victory in the Monaco GP for the new car. 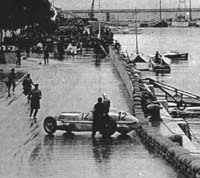 Varzi and Stuck took second and third places for Auto Union, the team's third driver Rosemeyer had crashed in the rain. After Monaco the Mercedes team perhaps thought it was business as usual, especially as Caracciola also managed to win the Tunis GP. But the victories had come more because of luck and Caracciola's driving abilities in the wet than because of the car. From then on it all went downhill. While Rosemeyer went from victory to victory the Mercedes team decided to call it a day in the middle of the season, the team going back to Stuttgart to concentrate on the 1937 car. In 1937 Fagioli signed for Auto Union but his rivalry with Caracciola continued, culminating at the Tripoli GP where Fagioli attacked his former team mate with a wheel hammer! By now Fagioli suffered terribly from rheumatism and after being a non-starter during most of the season he decided to retire from racing. He made a comeback in 1950 for Alfa Romeo but being third driver to Fangio and Farina did not appeal to him so Fagioli decided to concentrate on sportscar racing instead. It was during qualifying for the 1952 Monaco GP, that year held as a sportscar race, that Fagioli crashed his Lancia Aurelia, braking a hand and a leg. He seemed to be out of danger but three weeks later complications that proved to be fatal suddenly set in. According to legend, Fagioli had apologized for the Tripoli incident shortly before. Of course we only have Neubauer's words on that, just as we only have Prost's account of what he and Senna said to each other at Imola in 1994. Neubauer's book sometimes, shall we say, "improves on the truth a bit" - especially when Tripoli comes to mind - but if he thought that was the proper thing to do in the Fagioli case, why destroy a good story? A full description of the 1936 Monaco GP can be found here. Well, if there ever was a stupid manoeuvre in racing it was when Tadini took an oil-leaking Alfa and started the race with it. To make things worse there had been a little monsoon rain just before the start. Farina's Alfa had an oil leak, so he opted to take Tadini's car instead. A wise move if only Tadini had been wise enough to sit out the race. But he instead took the leaking car and started the race with it. So he pasted the track with oil on water and it was disaster waiting to happen. Poleman Chiron lost some places at the start and on lap 2, he spun in the oily-watery chicane and everyone hit everyone - or let's say... that was a close description! With like one third of the field taken out in this mass collision, the disaster was not over yet, a few laps later, the hot blooded Fagioli also spun at this corner, joining his fellow Mercedes drivers Chiron and Von Brauchitsch. Caracciola saved the day for Mercedes by winning the event in front of the Auto Unions of Varzi and Stuck. 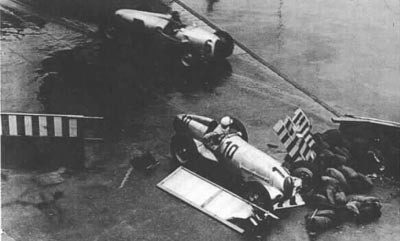 Nuvolari suffered some brake problems and had to give up his hopes of winning the race. This was the start of a bad year for Mercedes where they could only score 2 Grand Prix victories, here in Monaco and later also in Tripolis. For the rest of the year they were left watching the rear of Rosemeyer and his Auto Union. Fagioli, known as a hot tempered Italian had several clashes with Carraciola in Mercedes, once nearly hitting him on the head with a sledge hammer. It finally got him thrown out of Mercedes. Later after the war, Fagioli was part of the Alfa Romeo squad for the first FIA World Championship. Fagioli picked up 4 2nd places - however no win - and finished 3rd in the Championship. Later he met his old Mercedes chief Neubauer again, and was in talks to have another test drive for the Silver Arrows. It never got to that as Fagioli's love for speed killed him soon after that... His deadly crash took place, well, oddly enough, right here at Monaco when he exited the Tunnel sideways, hit a ballustrade and was thrown from his car.